At no time did Vienna playa greater role in the intellectual and artistic life of the German speaking peoples and of Europe than in the first three decades of the present century. It was the home of Mahler and SchOnberg, of Hofmannsthal and Schnitzler, of Mach and Wittgen­ stein, of Freud and of Austro-Marxism. Less known outside the Ger­ man-speaking world was Karl Kraus, whose whole work was insepa­ rably connected with the Vienna of his time and who, perhaps for this reason, may seem today more "provincial" than the others whom we have just named. Kraus was an apocalyptic moralist: The titles of some of his more important works unmistakably reveal it: "The last days of mankind" ; "The day of judgment" (WeUgerieht); "The end of the world by black magic" (U ntergang der Welt dureh die sehwarzeM agie). Like Kierkegaard, he was a witness against his time. But the symbolic object of the time against which Kraus bore witness was of an infinitely minor quality than Kierkegaard's. He did not attack the church of his country or the Christianity of his days; his main target was the Viennese press, a target of quickly passing importance, of which little remains today. 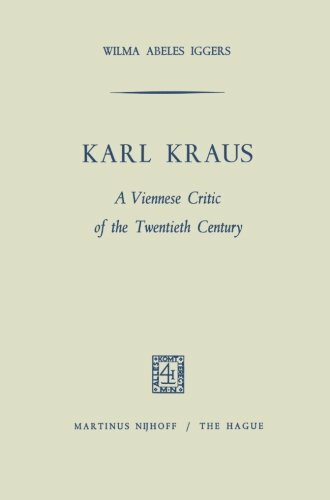 Kraus was a master of satirical invective and of the German lan­ guage, which he regarded as his most precious inheritance (Ahnenerbe). He felt a deep sense of responsibility for the proper use of the language. View More In Urban & Regional. If you have any questions about this product by Wilma Abeles Iggers, contact us by completing and submitting the form below. If you are looking for a specif part number, please include it with your message.